In the second part of our paper, we address crystal nucleation in the metastable liquid miscibility region of eutectic systems that is always present, though experimentally often inaccessible. While this situation resembles the one seen in single component crystal nucleation in the presence of a metastable vapor-liquid critical point addressed in previous works, it is more complex because of the fact that here two crystal phases of significantly different compositions may nucleate. Accordingly, at a fixed temperature below the critical point, six different types of nuclei may form: two liquid-liquid nuclei: two solid-liquid nuclei; and two types of composite nuclei, in which the crystalline core has a liquid "skirt", whose composition falls in between the compositions of the solid and the initial liquid phases, in addition to nuclei with concentric alternating composition shells of prohibitively high free energy. We discuss crystalline phase selection via exploring/identifying the possible pathways for crystal nucleation. The phase field approach is used to model heterogeneous crystal nucleation in an undercooled pure liquid in contact with a foreign wall. We discuss various choices for the boundary condition at the wall and determine the properties of critical nuclei, including their free energy of formation and the contact angle as a function of undercooling. For particular choices of boundary conditions, we may realize either an analog of the classical spherical cap model or decidedly nonclassical behavior, where the contact angle decreases from its value taken at the melting point towards complete wetting at a critical undercooling, an analogue of the surface spinodal of liquid-wall interfaces. We review our recent modeling of crystal nucleation and polycrystalline growth using a phase field theory. First, we consider the applicability of phase field theory for describing crystal nucleation in a model hard sphere fluid. It is shown that the phase field theory accurately predicts the nucleation barrier height for this liquid when the model parameters are fixed by independent molecular dynamics calculations. We then address various aspects of polycrystalline solidification and associated crystal pattern formation at relatively long timescales. This late stage growth regime, which is not accessible by molecular dynamics, involves nucleation at the growth front to create new crystal grains in addition to the effects of primary nucleation. Finally, we consider the limit of extreme polycrystalline growth, where the disordering effect due to prolific grain formation leads to isotropic growth patterns at long times, i.e., spherulite formation. Our model of spherulite growth exhibits branching at fixed grain misorientations, induced by the inclusion of a metastable minimum in the orientational free energy. It is demonstrated that a broad variety of spherulitic patterns can be recovered by changing only a few model parameters. 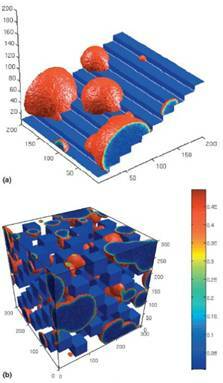 A phase-field theory of binary liquid phase separation and solidification coupled to fluid flow is presented. The respective equations of motion and Navier-Stokes equations are solved numerically. We incorporate composition and temperature dependent capillary forces. The free energies of the bulk liquid phases are taken from the regular solution model. In the simulations, we observe Marangoni motion of the droplets, and direct and indirect hydrodynamic interactions between the droplets. We observe that capillary effects dramatically accelerate droplet coagulation and that solidification interacts with liquid phase separation. A phase field theory, we proposed recently to describe nucleation and growth in three dimensions (3D), has been used to study the formation of polycrystalline patterns in the alloy systems Al-Ti and Cu-Ni. In our model, the free energy of grain boundaries is assumed proportional to the angular difference between the adjacent crystals expressed in terms of the differences of the four symmetric Euler parameters called quaternions. The equations of motion for these fields have been obtained from variational principles. In the simulations cubic crystal symmetries are considered. 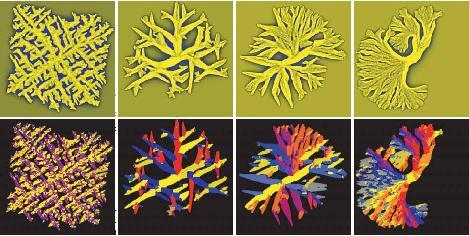 We investigate the evolution of polydendritic morphology, present simulated analogies of the metallographic images, and explore the possibility of modeling solidification in thin layers. Transformation kinetics in the bulk and in thin films is discussed in terms of the Johnson-Mehl-Avrami-Kolmogorov approach. A phase field theory with model parameters evaluated from atomistic simulations/experiments is applied to predict the nucleation and growth rates of solid CO2 hydrate in aqueous solutions under conditions typical to underwater natural gas hydrate reservoirs. 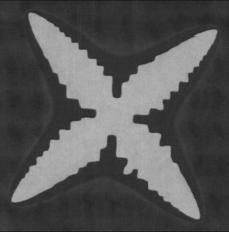 It is shown that under practical conditions a homogeneous nucleation of the hydrate phase can be ruled out. The growth rate of CO2 hydrate dendrites has been determined from phase field simulations as a function of composition while using a physical interface thickness 0.85±0.07 nm evaluated from molecular dynamics simulations. The growth rate extrapolated to realistic supersaturations is about three orders of magnitude larger than the respective experimental observation. A possible origin of the discrepancy is discussed. It is suggested that a kinetic barrier reflecting the difficulties in building the complex crystal structure is the most probable source of the deviations. We briefly review Our recent modeling of crystal nucleation and polycrystalline growth using a phase field theory. First, we consider the applicability of phase field theory for describing crystal nucleation in a model hard sphere Fluid. It is shown that the phase field theory accurately predicts the nucleation barrier height for this liquid when the model parameters are fixed by independent Molecular dynamics calculations. We then address various aspects of polycrystalline solidification and associated crystal pattern formation at relatively long timescales. This late stage growth regime, which is not accessible by Molecular dynamics, involves nucleation at the growth front to create new crystal grains in addition to the effects of primary nucleation. Finally, we consider the limit of extreme polycrystalline growth, where the disordering effect due to prolific grain formation leads to isotropic growth patterns at long times, i.e., spherulite formation. Our model of spherulite growth exhibits branching at fixed grain misorientations, induced by the inclusion of a metastable minimum in the orientational free energy. It is demonstrated that a broad variety of spherulitic patterns can be recovered by changing only a few model parameters.